President Donald Trump congratulated Andrés Manuel López Obrador for winning the election to become president of Mexico on July 1. Trump shared a 30-minute phone call with Obrador, during which the two discussed trade, border security, and the possibility of a bilateral Mexico–U.S. trade deal. Obrador, 64, former mayor of Mexico City, won by a landslide on July 1, dealing a crushing blow to establishment parties. In his account of the call with Trump, he stated on Twitter that he had proposed a comprehensive deal to create jobs, lower immigration, and improve security. While Trump’s foreign policy is directed by his “America First” motto, Obrador is very much a “Mexico First” kind of politician. Just like Trump, he’s been skeptical of the North American Free Trade Agreement, the trade pact with the United States and Canada, saying it wasn’t a good enough deal for Mexico. He wants to slash Mexico’s dependency on food and gasoline imports (major U.S. exports to Mexico) by fixing produce prices and reopening Mexican refineries. He wants Trump to help pay for economic development in Mexico so Mexicans don’t leave to work in the United States. “Our dream, which we’ll achieve regardless of whether Trump accepts or not, is that the Mexican can work and be happy where he was born,” he said during a campaign event in the southern border city of Tapachula. Trump, on the other hand, wants Mexico to pay for the border wall. Obrador also refused to help stem the tide of Central Americans traveling through Mexico to get into the United States, instead, asking for the United States to help with economic development in Central America. He also proposed Mexican consulates in the United States provide legal help to Mexican immigrants. Facing a country with a murder rate four times that of the United States, Obrador aims to convince young people to prioritize study and legitimate work instead of working for the drug cartels. “The people of Sinaloa [cartel] are not bad by nature, it is that many have been forced to take the path of antisocial behavior, many have had their future canceled and especially the young. That will not happen anymore,” he said, according to Mexican newspaper Milenio. He proposes paying low-income college students a $120 monthly allowance and setting up apprenticeships for students that would pay $180 a month. He also suggested amnesty for some gang members, though his aide said the pardon might apply to people imprisoned for growing illicit crops. Despite being described as a leftist, Obrador promised not to take Mexico down the socialist path that destroyed Venezuela’s economy. His campaign specifically made assurances he won’t push for the nationalization of private businesses. 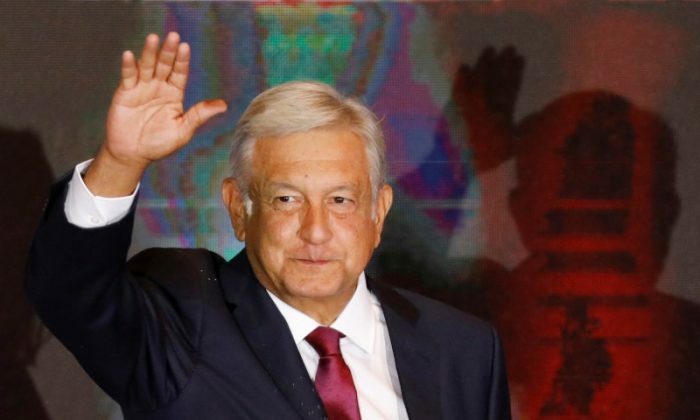 In his victory speech, Obrador sought to assure investors he would pursue prudent economic policies and central bank independence. Obrador will take office on Dec. 1 after getting more than 53 percent of the vote, preliminary results showed—more than double the votes of his nearest rival. He won the biggest share of the vote in a Mexican presidential election since the early 1980s, giving him a strong mandate to address Mexico’s domestic problems and face external challenges, such as U.S. tariffs. As Mexico City’s mayor from 2000 to 2005, Obrador was wildly popular as a political outsider of diligent, austere lifestyle. He invested in infrastructure, built schools, and cut tax breaks to developers to gentrify the downtown. He even brought over former New York Mayor Rudy Giuliani to help bring his successful form of “zero-tolerance” policing to stem rampant crime in the city of 20 million. Part of that effort was stamping out corruption in the police force, The San Diego Union-Tribune reported at the time. One of his major promises is to eliminate corruption in the Mexican government. “We are going to change this rotten, corrupt regime of injustices and privileges, and we are going to promote development. I can summarize it in one sentence: work, good salaries, and hugs, not bullets,” he said.